Investigators said that autopilot would had to have been manually switched on – but it’s still not known when it began running on autopilot. MISSING MALAYSIA AIRLINES flight MH370 was “highly, highly likely” on autopilot when it ran out of fuel and crashed, Australian officials said today as they announced the search will shift further south. “It would be fair to comment that it is highly, highly likely that the aircraft was on autopilot, otherwise it could not have followed the orderly path that has been identified through the satellite sightings,” Deputy Prime Minister Warren Truss said. After analysing data between the plane and a satellite, officials believe Flight 370 was operating on autopilot the entire time it was flying across a vast expanse of the southern Indian Ocean, Australian Transport Safety Bureau chief commissioner Martin Dolan said. 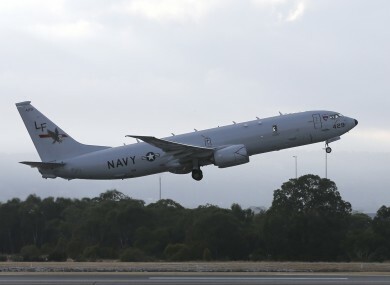 “Certainly for its path across the Indian Ocean, we are confident that the aircraft was operating on autopilot until it ran out of fuel,” Dolan told reporters in Canberra. The basic assumption would be that if the autopilot is operational it’s because it’s been switched on. But exactly when the Boeing 777 began running on autopilot is still not known. “We couldn’t accurately, nor have we attempted to, fix the moment when it was put on autopilot,” Transport Minister Warren Truss said. It will be a matter for the Malaysian-based investigation to look at precisely when it may have been put on autopilot. The latest nugget of information from the investigation into Flight 370 came as officials announced yet another change in the search area for the wreckage of the plane that vanished during a flight from Kuala Lumpur to Beijing on March 8 with 239 passengers and crew on board. The new search area is located several hundred kilometres southwest of the most recent suspected crash site, about 1,800 kilometres off Australia’s west coast, Dolan said. Powerful sonar equipment will scour the seabed for wreckage in the new search zone, which officials calculated by reanalysing the existing satellite data. The shift was expected, with Dolan saying last week the new zone would be south of an area where a remote-controlled underwater drone spent weeks fruitlessly combing 850 square kilometres of seabed. That search area was determined by a series of underwater sounds initially thought to have come from the plane’s black boxes. But those signals are now widely believed to have come from some other source. The new 60,000 square kilometre search area falls within a vast expanse of ocean that air crews have already scoured for floating debris, to no avail. Officials have since called off the air search, since any debris would likely have sunk long ago. The hunt is now focused underwater. Beginning in August, private contractors will use powerful side-scan sonar equipment capable of probing ocean depths of 7 kilometres to comb the ocean floor in the new search zone. The job is expected to take 12 months to complete. Meanwhile, two survey ships are mapping uncharted expanses of seabed in the search zone before the sonar scanning starts. The search area has changed multiple times in the months since Flight 370 vanished, as officials struggled to make sense of the limited data the flight left in its wake after it dropped off radar. The new search zone was largely identified by an analysis of hourly transmissions, or “handshakes,” between the plane and a satellite. Email “Missing MH370 was "highly, highly likely" on autopilot when it ran out of fuel and crashed”. Feedback on “Missing MH370 was "highly, highly likely" on autopilot when it ran out of fuel and crashed”. ‘Most parsnip seed packets will tell you to sow them in February – don’t do it,’ writes Michael Kelly. ‘We can all help to change the outdated teachings, traditions and structures which repel many adults and young people,’ writes Joe Mulvaney. ‘One day I realised I didn’t want to hide my arm anymore. I didn’t want to be ashamed of my body. I wanted to embrace it,’ writes Paralympian Ellen Keane.